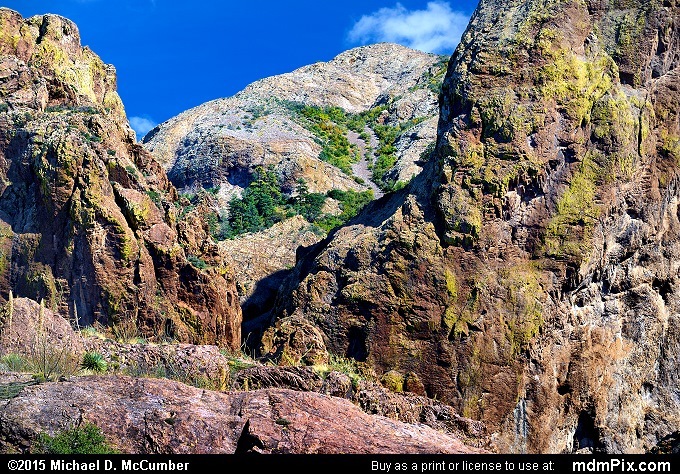 While the northern Organ Mountains east of Las Cruses, New Mexico are jagged granite often sharp as teeth pointing skyward, the mountains in this location are bubbled hardened magma more rounded than jagged. A window in some impressively tall cliffs of igneous rock reveals the distant 8,445 foot tall Baldy Peak as seen from the Drippings Springs Trail in the Organ Mountains-Desert Peaks National Monument. Baldy Peak is short compared to other mountains in the Organs. Some ponderosa pines can be seen growing along its lower slope.